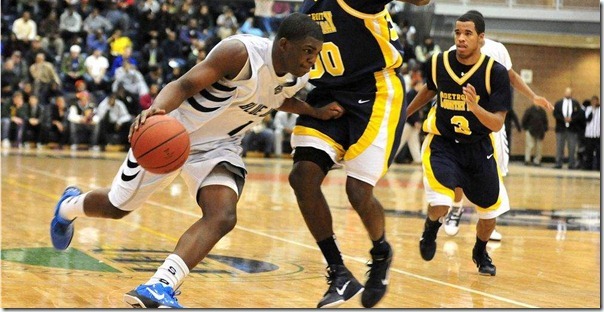 Southfield lost to Detroit Country Day and Amir Williams, 79-58, and Brundidge had 15 points in the loss. Southfield responded with a blowout win over North Farmington and Brundidge had 18, 13 in the first half. Southfield is 8-3 and first in the OAA with a 5-1 conference record. As for Brundidge, he had a rough shooting night missing shots I normally see him hit. He finished with 15 points on 5 for 18 (3 or 4 forced shots) shooting. The big positive was he was able to get his shot off against a very good athlete Knight that is 6-3 or 4 and is a D-1 WR prospect for football. CB quickness allowed him to create some open shots. Burke continues to put up monster numbers. In a span of four games in six days last week, Burke scored 110 points (27.5 ppg), all in victorys. (HT: @ohiohshoops) Burke is averaging 24 points and 7 assists per game and Northland is now 14-0. Robinson had 19 points earlier in the week in a 68-56 loss to No. 1 Merrillville. Robinson kept Lake Central in the game early on but only had 2 points in the fourth quarter. TheWolverine posted a nice scouting report of Robinson ($). St. Mark’s hasn’t played since January 22nd due to exams but will be back in action tomorrow versus Belmont Hill. JaVontae Hawkins had 18 points in a win over Carman Ainsworth. Super sophomore point guard prospect Denzel Watts had 14 points and 2012 wing prospect Anton Wilson added 13. Hawkins also scored 13 points in an easy win over Flushing. Pershing knocked off Denby by a score of 62-45 but we haven’t been able to locate a stat line for Dorsey-Walker. Twelve points and 11 rebounds in a 76-33 win at Bridgton Academy on Jan. 26. Ten points in a 99-36 win over Phillips Exeter Academy on Jan. 28. Fourteen points in a 108-68 win over the South Kent School on Jan. 29. Brewster Academy won at Maine Central Institute 78-71 on Jan. 24, but McGary was not listed among the leading scorers. Hare had a monster performance in a win over Midland, scoring 32 points, grabbing 15 rebounds and swatting seven shots. Point guard Derrick Walton was on hand for Michigan’s win over Iowa. The talented floor general had 30 points in a win over Bradford Academy. Basil Smotherman scored 12 points in a 79-20 win over Indianapolis Herron and added 17 points in a 60-53 win over Guerin Catholic. Zak Irvin scored 9 points in a 45-41 win at McCutcheon and 14 points in a 80-33 win over Brownsburg. Steve Haney is now eligible for Lansing Eastern (transfer) and will provide a boost for the Quakers down the stretch. Eastern will face off against Haney’s old school, East Lansing, tonight. MAS filed this report on big man Leo Edwards in our comments section a couple weeks back: Leo Edwards a young 2013 got the start for Cass and looked much more comfortable then last time I saw him. Played well in D and if I guesstimated his numbers I would say 7pts, 8 boards and 4 blocks. I think this is a kid who might develop slower than some of the other 2013s but might have a pretty big upside.